This week we’re getting the scoop straight from the mouth of a special and observant pair of waders! The ultimate point of view, you don’t want to miss. The CfR 2019 Retreat Season is here and I am so excited. I have been hanging around since November. It is time to be dusted off, conditioned and get ready for a very busy year. I’m relatively new here (donated in 2018) so this will be my first full retreat season and can’t wait to be put to work. Montana winters tend to be quiet and it is especially so around the Casting for Recovery office since no retreats are scheduled during this time. However, one January morning, our quiet, organized space was turned upside down. I heard lots of chatter, laughter and counting filled the air. The team was taking inventory of all CfR fly fishing equipment. 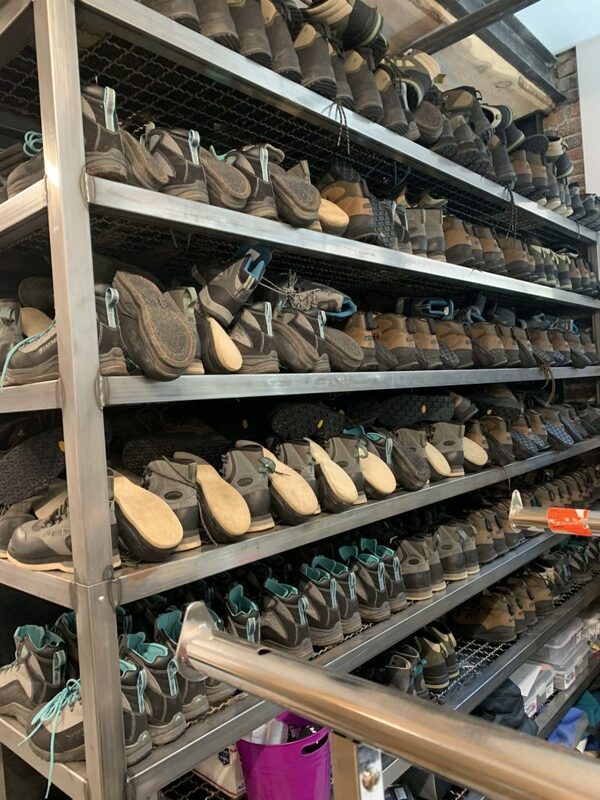 Hundreds of pairs of wading boots organized for the season. First the boots were counted and inspected. New ones were added, and old ones were retired. The retired boots were the saddest as they had given so much of themselves trudging through mud, sand, frigid waters and tough terrains. CfR owes them a debt of gratitude for keeping the women on their feet! Wait!…Now the waders are being pulled down! How can that be? Can’t you count us while they hang? Please don’t disturb us in our corner! Oh no, I have been pulled down along with my sisters and we are being inspected and counted also. I hope I am not retired. I can’t be, I am so young! What if I am put together with another wader group? I joined the group last Fall so I know I still have a lot to give, but I’m still new enough that I do not know everyone. Some are being retired and we say a silent prayer of thanks for all they did to protect the women. 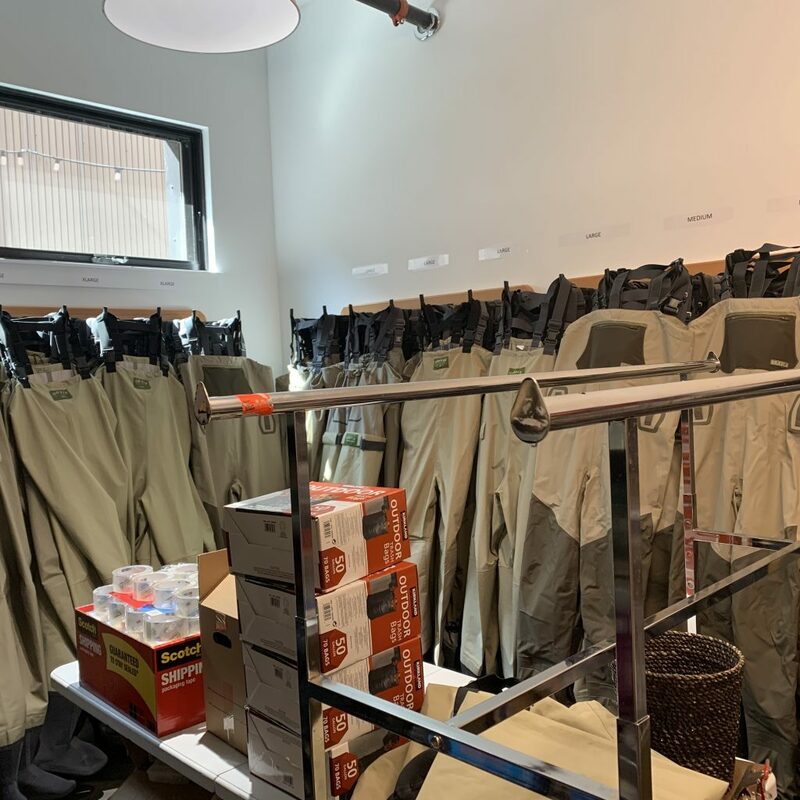 New waders are being added to our group. We welcome them with open arms. That’s me in the corner! 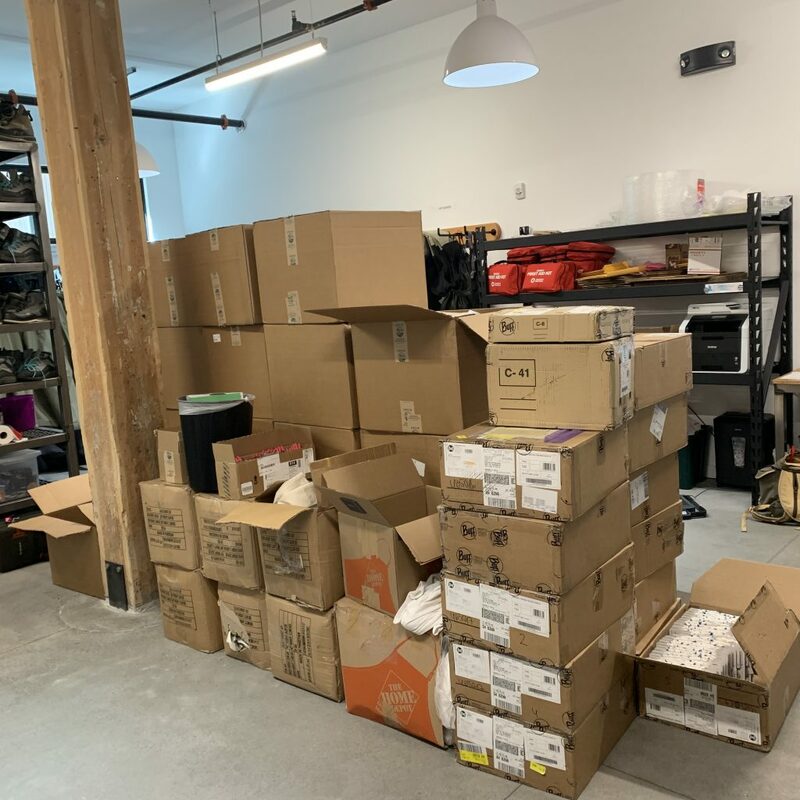 March rolls around and boxes upon boxes start arriving to our office. It seems the staff has had to create tunnels around the boxes so they can move around. What is going on? Why so many boxes? As I overhear their conversations, Whitney and Denise are discussing the promotional items that have arrived, the ones on back-order and when to ship it all. There are hats, pens, Ty-Rites, buffs, tote bags, decals, and a slew of other fun items. It seems that the Program Coordinators will have fun this year with all the swag they will have available to give away and sell. From where I hang, I can see new buckets, brushes and towels. I remember last year sometimes I would come back tired, scuffed up and dirty–ready for a shower. It would have been nice to have been able to take a shower before being packed up for the return flight home. These cleaning items will be sent to each retreat to ensure that I am cared for after the participants are done finishing. Retreat equipment and promotional materials for shipping and receiving. I’m not exactly sure when and where I’ll be sent, but I do know I will be on active duty every weekend in August and September. That is a crazy time around here. We are all on call 24/7 and we never know when we will be deployed, but ready and willing. Our busy season calls for 3-4 retreats each weekend. As an example, the retreat coordinators receive the gear on Wednesday or Thursday, the retreats are held Friday through Sunday, and the gear is returned on Monday. It is a harrowing fast-paced time. We, the Waders and Boots, are happy to be part of this wonderful organization. Our job is to keep our participants warm and safe, so they can enjoy a few hours of fun, peace and camaraderie while learning a new sport. Thank you for allowing us to be part of the CfR retreats!